Copper - commonly associated with solar cells and microwave radiation is used to create one of our bestselling lights. The Copper is created by exploding a thin layer of pure metal onto the internal surface of a polycarbonate globe. 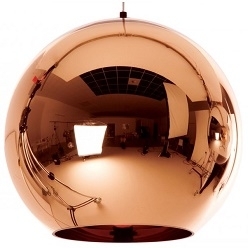 The result is a highly reflective surface with a warm metallic glow. Copper - commonly associated with solar cells and microwave radiation is used to create one of our bestselling lights. The Copper is created by exploding a thin layer of pure metal onto the internal surface of a polycarbonate globe. 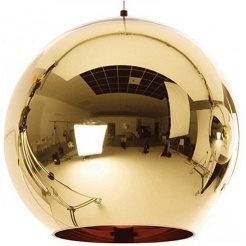 The result is a highly reflective surface with a warm metallic glow. Can be hung in multiples using Pendant System or as a single pendant light, to create a focal point. Also available in a floor version, in a Bronze-Copper or Copper finish.